In last post I mentioned an analysis done by a group of VCPs. 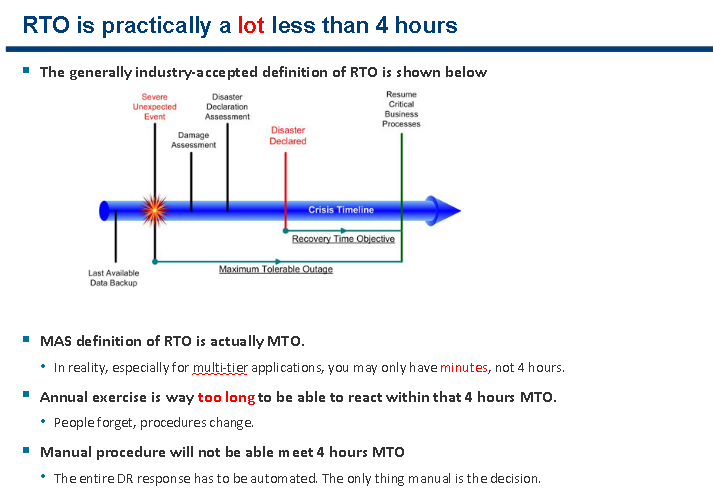 In their ppt, one slide is worth more discussion which is the 4 hours RTO defined in MAS notice to banks. The reader has to distinguish between recover to full services and recover to a service level. When disaster happens, everything has to be prioritized. Not all program are the same when you have limited resources and time. We may not expect to pay telephone bill via ATM when there is serious flooding but you expect the ATM shall still let you draw money. The slide (shown below) highlighted the time differences between event happen and disaster is declared. Due to complexity of current system and network, the time to fully assess an system malfunction may take hours. Usually the incident handling procedure will require a few clarification (if not finger pointing) until senior staff is informed about the major outage. How a bank response to outage is now a critical element in meeting MAS requirement on RTO. The authors of this slide contended that it is far less than four hours and manual steps are not going to meet this requirement. I believe they do have a point. Will the MAS TRM requirements and notice makes 24×7 internet banking a white elephant? Let us wait until the 2104 DBS annual report and found out their cost ratio. This entry was posted in Cloud, Geographic, Information security strategy, Singapore, Technology and tagged Cost Ratio, DBS, MAS, RTO, Singapore on 20/07/2013 by antonyma.